said banking expert Wadih Alhantal the importance of working on the development of the banking sector and access its services to the global products that must be provided to the public beneficiaries, pointing out that the ways of development of the financial sector has become more affordable than before after the entry into force of the country from the provisions of Chapter VII. Posted in Assyria, Central bank, Central Bank Iraq, Chapter VII of the United Nations Charter, Iraq, Iraqi Central Bank, Iraqi Dinar/Politics, MasterCard, Microsoft. The member of the Commission services and reconstruction MP Ihsan al-Awadi, that the amendment to the Iraqi Investment Law No. 13 of 2006, will address the errors that occurred before it. Posted in al-Awadi, Commission, European Commission, Government, House of Representatives, Iraq, Iraqi Dinar/Politics, Law, United States. Central Bank President Agency Abdul Basit Turki that the potential of Iraq outweigh the challenges we face and Maliki said in a speech him during the celebration organized by the Trade Bank of Iraq on the occasion of the tenth anniversary of its founding and attended (range Press), "The bank opened new avenues for trade in the country, and after that became a partner with the international banks in the development of trade relations and business banking, including aspiring to him Iraq from the advancement of urban and investment." Maliki said that "the establishment of Bank of Iraq was to reduce the weight of the item VII, which under the Iraqi economy, after that it was necessary for Iraq from the window of deals which with the world." He said al-Maliki "as was the establishment of the bank to find a window to support the private sector in order to promote Besides the public sector in the process of construction, reconstruction and investment, as well as meet the necessities that you need to process the infrastructure of the country because of the wars of the former regime." Maliki confirmed that "the Iraqi banking system is unable to meet all the needs of the country, in spite of the pieces come a long way and putting foundations stable." and noted al-Maliki that "raising the provisions of Chapter VII is an important step in the way of raising investments in the country," praising the role of the "international community through the cooperation of the Security Council and the countries that stood by side Iraq to raise these harsh judgments about our economy, and that led to the decline in Iraq’s oil production to less than one million barrels." He Maliki "After Iraq would emerge from these provisions and restore the world’s confidence in our economy, we urge the pace towards the two main issues are the reconstruction and construction, trade, oil and gas, as well as work on multiple sources of income of Iraq through activating tourism and industry." He Maliki that "the Iraqi people suffered greatly from lack of services and continues to suffer," stressing the need to "match the services provided with the wealth enjoyed by Iraq’s rich, through the use and optimum use of the country’s wealth, and draw a clear policy to promote." of For his part, the President of the Central Bank and Agency Abdul Basit Turki that the potential of Iraq outweigh the challenges we face, pointing out that the near future will be a surprise, while pointing out that Iraq is open to all who wish to invest and rebuild the institutions in the country. said Turki in a speech during the ceremony that "months assigned to it in the management of the Central Bank of Iraq, I can tell them that our capabilities far outweigh the challenges that we face," he said, adding that "the near future will be a surprise." said Turki that "delegations of representatives of the major banks in the world visited Iraq during the last period to begin to exercise their activity in the Iraq, "stressing that" Iraq is open to all who wish to invest and rebuild the institutions in the country. " and TBI is the Bank government, was founded in Baghdad in July 2003 for the purpose of facilitating trade facilitation Iraqi Foreign Affairs and the reconstruction of Iraq after the United Nations oil-for-food and owned fully in favor of the Iraqi Ministry of Finance, and in a short time period saw the bank’s rapid development and significant and tangible as a banking effective structures in which a network of relationships with the top 134 banks in the world covering the various continents. was Iraqi Prime Minister Nuri al-Maliki, described in a speech after vote the Security Council to remove Iraq from Chapter VII, in (June 29, 2013), that the decision is "an important step to restore the status of Iraq’s international," stressing that the international resolutions "has become one of the past," While considered that Iraq "has become liberally" restrictions imposed because of the "follies" of the former regime, appealed for all countries in the region and the world to "extend the hand of friendship," and stressed that "Iraq can not be involved in the policy of axes and polarizations." The Secretary-General of the United Nations Ban Ki-moon, called in, (18 June), an end to the sanctions imposed on Iraq since the invasion of Kuwait in 1990 under Chapter VII of the Charter of the United Nations, noting in a report submitted to the UN Security Council, the governments of Iraq and Kuwait "seasoned and respected in removing the effects of that invasion." The Iraqi foreign minister, Hoshyar Zebari, called in (13 June 2013), the United States and Britain, through their ambassadors in Baghdad, Robert Stephen Beckerovi, Simon Collis, to support Iraq out of Chapter VII, as he emphasized the pursuit of Baghdad to expand its consultations with the members of the Board Security Council to help and support Iraq in its quest, after a day of visiting Kuwaiti Prime Minister Jaber Mubarak Al-Hamad Al-Sabah, to Baghdad at the head of a ministerial delegation large, and the Declaration Zebari, in a joint press conference with Kuwaiti Foreign Minister Sabah Khaled Al-Sabah, that Iraq had fulfilled all of its obligations incurred by him in the seventh chapter with Kuwait and will move to Chapter VI, noting that Iraq has signed agreements with Kuwait, six in all fields, as pointed Kuwaiti Foreign Minister said his country would be the United Nations of the need to exit Iraq from Chapter VII. Posted in Iraq and CBI. The head of the central bank and agency Abdul Basit Turki, Sunday, the possibilities Iraq outweigh the challenges we face, pointing out that the near future will be a surprise, while pointing out that Iraq is open to all who wish to invest and rebuild the institutions in the country. Turki said in a speech during a ceremony marking the tenth male Iraqi Trade Bank, said, "commissioned by the months in the management of the Central Bank of Iraq, I can say that Amkantina far outweigh the challenges we face," he said, adding that "the near future will be a surprise." Turki added that "delegations of representatives of major banks in the world visited Iraq during the last period to begin to exercise their activity in Iraq," stressing that "Iraq is open to all who wish to invest and rebuild the institutions in the country." Prime Minister Nuri al-Maliki was considered, on Sunday (July 7, 2013), that Iraq has not yet reached the ambition to establish the banking system, noting that Chapter VII was an impediment to international companies to enter Iraq. It is noteworthy that the Iraqi Central Bank was established as a bank independent under its law issued on the sixth of March of 2004, and is responsible for maintaining price stability and the implementation of monetary policy, including exchange rate policies and being sessions a day for the sale and purchase of foreign currencies with the exception of public holidays which stops Bank of the auction. 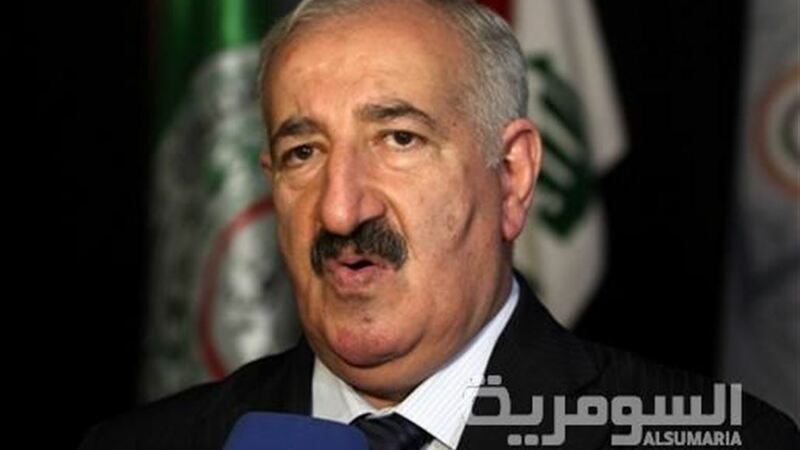 A member of the Finance Committee parliamentary MP / National Alliance / Abdul Hussain al-Yasiri, the Central Bank of Iraq in order to work a project to delete the zeros from the Iraqi currency, because he is not eligible to apply. But the bank says we are not qualified with the present, to implement the project. explained: to delete the zeros him Fouad on the country, which will reduce the money supply, and contributes to the Iraqi currency be like the rest of the other currencies, and accelerates from dealing in Iraqi currency, and will reduce the forging process of the Iraqi currency, because the new currency will gain Takina better than the present. Day is the former deputy governor of the Central Bank of the appearance of Mohammed Saleh, and 30 employees, in court for trial on charges of "corruption" and "waste of public money" and "manipulation of the price of the currency," while the face of economists and intellectuals, journalists and writers, appeal to advocate for and claim acquittal. And accused the government last year, Central Bank Governor Sinan al-Shabibi and his assistant, the appearance of Mohammed Saleh, a large number of Modfa Bank to "deliberately wasting public money" and manipulation ERA Bank and the impact on the price of Aldnyar Iraq and announced warrants catch Shabibi and Saleh during their participation in an international conference outside the country. And former MP of the Central Bank the appearance of Mohammed Saleh in an interview with "the world" yesterday he was "completely innocent" of the charges against him, describing it as "targeting the central bank and its symbols and its staff and try to Tmder the Iraqi economy." "I am today not in a position to tell everything you know, so as not to be charged with another because of comments here and there, but I know very well that some political parties are behind the fierce campaign, which affected the central bank." And added, "I do not deny the existence of corruption endures some of the people in the bank as is the case in all the institutions of the Iraqi state." He continued, "but we deny the charges manipulation sales of the bank and say," It exceeded the need for the Iraqi economy, "which means that he needs is half the quantities sold, also deny the fluctuation of the exchange rate, which holds the bank despite the presence of external factors hit the economy and market local at the same time." And between Saleh said that "there is political will try to change the bank officials and the use of others enjoy the loyalty of some of the political blocs at the expense of talent and personalities that have a long tradition in economic work." He advised in favor of the government to close the file of the Central Bank as soon as possible for "the interests of Iraq and not to risk his economic future", as he put it. And the appeals that will be presented during the trial, he said, "we will rely on the central bank law, paragraph 23, which gives immunity to the bank’s employees while performing their work, and what happened is a violation of this immunity and beyond the law." He stressed that "the larger issue of manipulation and wasting public money, and a mistake to think that he knows the dimensions of what happened." "There are internal and external parties involved in the matter and taking advantage of targeting the CBI the reported one day in the diary." He added that "the biggest proof of my words this is that the government experimented with many of the staff during the past few months and try to change the banking and financial policies but failed and the bank now works according to the mechanisms by which we walked through the years." In parallel, the face of dozens of economists and Iraqi professionals and intellectuals on trial in favor of the appeal, demanding the "liberation from this legal arbitrariness." According to the appeal, which received the "world," a copy of it, "after the campaign defamatory, which affected the central bank and the province of the article illegally nor unconstitutional, Dr. Sinan Shabibi, and his deputy, Dr. appearance of Mohammed Saleh and his arrest, and the arrest of a number of employees and staff of the Central Bank of each was responsible for the acts of executive auction of foreign currency to the Central Bank, now came the role of Deputy Governor appearance of Dr. Mohammed Saleh, after he was released, to appear before the judiciary charges are not clear, and completed this series the absence of Iraqi competencies known for contributing to the formulation of monetary policy in Iraq, which has achieved remarkable stability exchange rate of the dinar After decades of Iraqi collapse." He said the appeal "as it is known widely, the campaign on the last economic fortresses of professional work in the Iraqi state, the Central Bank of Iraq, with the aim of access to foreign currency reserves former conservative who stood against the use of illegal lending to the government." He added that "the appearance of Dr. Mohammed Saleh economic seasoned affairs of monetary policy and knows many people also through his meetings with the media, and has worked at the central bank since the seventies, and included in his work there, until he became vice-governor of the past few years, with contributions known in the economic literature Iraqi and others." "We are Kaguetsadaan and professionals and intellectuals Iraqis, express strong concern, which continued to happen for a few months in targeting the central bank by targeting competencies and cadres professional, including our colleague Dr Mazhar, who stand in solidarity with him, and with Dr. Sinan Shabibi, however Messrs. Hassan Hashem al-Haidari, and Hazem star Ani who ruled unjustly for six months, in addition to the two women Fauzia Kazim Ali and Haifa Peter, of employees Bank who are still in jail for a few months without the right to their release on bail despite the conditions difficult humanitarian. and we demand their immediate release, Heroes and all prosecutions of illegal and unconstitutional against them, and returning all their rights as employees of the Central Bank. " He Mtalego call to say, "We Kaguetsadaan and professionals and intellectuals Iraqis express once again our solidarity moral complete with a colleague Economic known appearance of Dr. Mohammed Saleh, who is suffering from chronic diseases such as high blood pressure, diabetes and other diseases difficult for those in the age, and hold state and its judicial responsibility in the event that any deterioration in health. demand respect for the Central Bank Law issued on March 6, 2004 and applied to the staff of the Central Bank of Iraq and the liberation of this legal arbitrariness, their experience in the case of a lot of the staff respected central banks globally." Posted in Dinar Speculator, Iraq HCL and Oil/Gas Updates. Posted in Citi, Citigroup, Dinar Speculator, Iraq HCL and Oil/Gas Updates. Announced Iraqi Central Bank Governor agency Abdul Basit Turki Head Office of Financial Supervision, said the reserves the central bank has 76 billion dollars. said while attending the opening of the Building Directorate of Financial Supervision in Karbala: "There are stocks with the Ministry of Finance out of stock of the central bank, and there are expectations raised roof of the general budget of the country in the future. "and added:" The support of the Iraqi currency is not based on gold, as it is only 10% of the stock of the state, and Iraq will depend in treasury since 1971 hard currency. which was imposed by Chapter VII, " a new approach more sophisticated in the budget in the currency exchange rate in the country and will move more easily after the lifting of the restrictions, trusteeship, which was imposed by the Chapter VII, "
the other hand, sales of the Iraqi Central Bank of the dollar at an auction sale and purchase of foreign currency on Wednesday to 269 million and 801 000 dollars, after it reached yesterday, 165 million and 982 thousand dollars, a stable exchange rate was 1166 dinars per dollar. "The demand for the dollar distributed by 75 million and 600 thousand dollars was sold in cash, while the value of the amounts sold form of remittances 194 million and 201 thousand dollars, Select a price to 1179 dinars per dollar, and the purchase price cash of $ 1171 dinars. as well as Other reasons are different. Iraqi central bank held six sessions a week for auction sale and purchase of foreign currencies, starting from Saturday to Thursday.